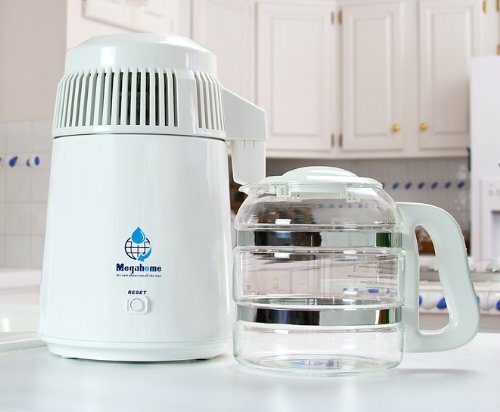 The Megahome Countertop water distiller is a lightweight and compact distiller that produces pure, clean steam distilled water. It’s made with glass and stainless steel, while others are made with toxic plastic that can contaminate your water. This distiller can make 1 gallon of pure steam distilled water in 5.5 hours and a complete 4 gallons per day. It’s also very simple to use; first you fill up the boil chamber with water, then just press the start button and voila, leave and come back in about 5.5 hours. There is also a spot to insert the provided carbon filter which is recommended. There’s also no need to worry because the distiller automatically shuts off when the cycle is complete. So, you might be wondering, “why do i need to distill my water?” Well for one, using distilled water in your appliances, such as irons, steamers, coffee makers and other appliances often increases the life expectancy of these items. Also, just boiling water doesn’t get rid of toxic peptides commonly found in water because they tend to be temperature resistant, but the megahome countertop distiller gets rid of these peptides making your water healthier and safer for you and your family. Lightweight, compact, and simple design. Made with non-toxic parts which are constructed from stainless steel, glass and food grade polypropylene. Distills 1 gallon of water in 5.5 hours and 4 gallons/16 liters of distilled water a day. Size: 8-inch width X 14 ¼ inch height, weight: 7.7 lbs, power source: AC 120v/60hz, power consumption: heater 565W + cooling fan 15W = 580W total. Warranty is good for 1 full year and that includes parts and labor. Included in package: water distiller, detachable power cord, condenser top, residue cleaner 8 oz, 6 carbon filter packs, 1 gallon glass collection bottle, glass nozzle insert. 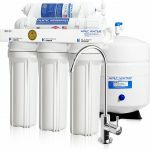 So, if you think you could benefit from investing in a water distiller, the Megahome Countertop Water Distiller, White, Glass Collection may or may not be a good fit for you. 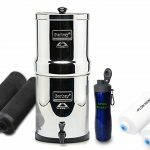 It’s simple and easy to use, makes 1 gallon of distilled water in about 5.5 hours, and is made from great materials such as stainless steel, glass, and food grade polypropylene. Uses carbon filters that can help the water taste better, and these filters are also optional which is nice if you're on a strict budget. Speaking of budget, this particular distiller is about middle range as far as prices for water distillers go so you'd have to decide for yourself whether that's a pro or a con. There are a few negatives to consider like, if you prefer the taste of the water with the carbon filters then that's an added expensive, the sound of the cooling fan may bother you depending on where the distiller is situated in your home, or even the possible hassle of scrubbing residue and sediment from the distiller. But who knows maybe you won't mind the cleaning and may find the sound of the fan to be very soothing, who am i to say? Simple and easy to use. Lightweight and compact design which is good for home use and for use on the go. Design is also modern and classic looking so it complements any kitchen style. Parts are made from high grade 304 stainless steel. Parts such as boil chamber, dome, and condensing coils. The collection bottle is made of glass and the nozzle is lined with glass which is nice so water stays pure and never touches any toxic plastic. As distilled water is produced it drips into the glass lined nozzle and then right into the glass water collector. Lid and handle are from food grade polypropylene, so it is bpa free, and the lid is removable. Carbon filters are optional to use but do improve taste. Carbon filters are recommended to be changed every 30 gallons or so and this can add up over time and be expensive depending on how much you use your distiller. If you let the distiller run its full course there will be residue and sediment on the sides and bottle which can be a hassle to clean. 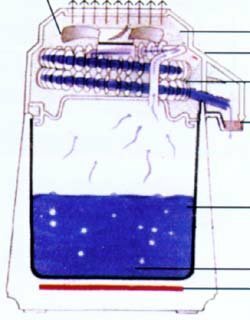 If you stop the process a little before all the water is gone from the bottom it can make this process easier but you'll need some kind of timer to remind you of this. Also, the button that turns the distiller ON does only that, there is no OFF button so you'll have to completely unplug if trying this method, want to stop the process early for any reason. But that may be going against the warranty, I would recommend reading the warranty over before doing any of this. Shape of collection bottle may be awkward or inconvenient to clean. The cooling fan does give off a noise and can be disturbing to some people.